Winter time in Colorado doesn’t offer much in the way of seasonal and local eating. The fields are bare, recovering from the last growing season and getting ready for spring. In many areas, a layer of soft, fluffy snow covers the fields helping the soil hydrate and offering protection from the strong winds that plague the plains. Unless you absolutely adore pumpkins and winter squash, it’s slim pickings out at the farms! My local farm sources greens, green house tomatoes, cucumbers, free range eggs and meat from farms nearby, so they strive to offer a nice selection. But still, it’s hard to live on winter squash and potatoes alone. Eventually, we do have to resort to the local shops to jazz up our supper time and succumb to California and South America grown produce; not very local but I can’t eat winter squash everyday. Though, I’ve been making my Roasted Butternut Squash and Sweet Potato Salad almost every week these days. It is a nice change to eat leafy greens and enjoy the fresh burst of flavour from the pomegranate arils. The temperate climes are still feeding us well and keeping our produce fridges well stocked. We have plenty of greens, broccoli, cauliflower, cabbages and Brussels sprouts, thankfully, all my favourite cruciferous vegetables are abundant. It took me a long time to love Brussels sprouts after the abuse we both underwent at the hands of the convent catering. Those poor Brussels sprouts were boiled to death and their stench at lunch time was overbearing and incessant. They were over cooked and under seasoned, ugh, they were awful. Every time, I went to buy them, my hand would just stop in mid reach, memories of nausea and that unforgettable sulphuric smell would come flooding back. I would withdraw my hand and move on. It is only after I started this blog that I decided to really overcome my fear. I love cabbage, why couldn’t I love Brussels sprouts? In essence, they are the same thing; little cabbages. So, fast forward a few years and here we are; loving Brussels sprouts. My favourite way to cook them is roasted or just sautéed. They are so sweet and delicious you don’t need to do much more. One of my favourite ways to make cabbage is a quick Indian stir fry with mustard seeds, curry leaves and green or red chillies. The cabbage stays crisp tender and a vibrant green with the nutty taste of the mustard seeds and a nice herby pop from the curry leaves. To change up my usual Brussels sprouts routine, I fried them up this way, and they were excellent. Once again, they are mildly spiced and the heat can be adjusted by adding more or less green chillies. 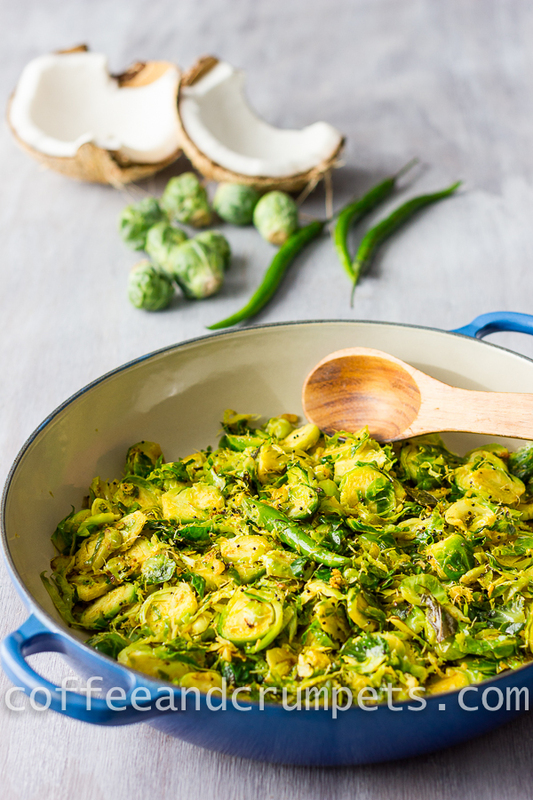 I added fresh coconut to these Curried Brussels Sprouts, and it is optional but it does add a pleasant texture and a mild tropical flavour. I also used coconut oil to sauté the vegetables (mine was refined for the high heat so the flavour was mild, unrefined will be stronger with a pronounced coconut taste). Indian curries come in a dry preparation, like this one and more fluid ones like the lentil curries and the meat kormas. If you are making a meat korma with lots of gravy, then this is a nice vegetable side dish. Brussels Sprouts sautéed with mustard seeds and warm Indian spices. In a large skillet/fry pan, heat the oil on medium high. Carefully add the mustard seeds and allow them to pop. Add the green chillies if using and the curry leaves and then add the shredded Brussels. Toss the Brussels around in the oil, mustard seeds and the curry leaves. Add the garlic, ginger, turmeric, cayenne powder, cumin and coriander. Stir fry till fragrant and the Brussels sprouts are beginning to get tender. Add the fresh coconut, if using. You don't want to over cook; the colour should still be a vibrant green and the texture crisp tender. Continue cooking until the texture is what you like, about 15 minutes or so for crisp tender. Check the salt and season accordingly. Stir through the cilantro before serving, if using. You can use any neutral flavoured oil with high heat capability. The thinner you can hash/shred the Brussels sprouts, the quicker they will cook and become tender. If you have big pieces, you can cover the pan briefly to steam cook them slightly. Do you have a love or hate relationship with Brussels sprouts? And could you survive on winter squash and potatoes? Hope you’re having a great weekend; mine’s hectic as usual! Where does the time go? I love Brussels sprouts but I think I could love them even more the way you’ve prepared them here. Nice way to cook brussels sprouts…I love all the spices in it…these ones look great, and so colorful…great side dish Nazneen. Although I am not a fan of brussels sprouts, I do love curries. I’d be happy to use this recipe to make another curried vegetable. Have a great week, Nazneen! Denise Browning@From Brazil To You recently posted..Five-Ingredient Beer Brigadeiros and The History of Sweetened Condensed Milk — No Haters Allowed! I am a big fan of brussels sprouts, as said it took me a while to actually start liking it. Love your curried version and use of fresh coconut. Although I eat Brussel sprouts very frequently, I haven’t seasoned with curry flavor before. And I love the sprinkle of coconut. Must check this recipe out! Love all the flavors in this Brussels sprouts dish! I am a BIG fan of brussels sprouts. I discovered them a few years ago…looked up a few recipes (mainly roasting them with bacon or a gratin) and started enjoying it. But I do not know a lot of ways to cook with them so this recipe will be used pretty soon (my-in laws are coming over). It looks so amazing that I know my family will love it. And you really can’t go wrong with curry, can you? Mouth dripping (that is a terminology I have pick up from my little boy) photos as usual. I’ve only tried Brussels sprouts once and it was the first and last time I’ve tried them. I just steamed them – they were frozen – and they came out horrible that hubby said NEVER again :). But your recipe looks very appealing to me.. also I have never used coconut oil in cooking anything except Basbousa – Arabian semolina cakes- so this recipe is full of new things for me. May be I should try my hands again with those little green stuff. Your pictures are very nice. I’m sorry to hear that! Steaming and boiling is not a good prep for Brussels, it invariably brings out the smell ones in them. Roasted or sautéed really caramelises their sugars and sweetens them. They are wonderful that way. This way is great too, but the trick is to not over cook Brussels sprouts…ever! I am sure these tasted great. I make the cabbage curry just the way you do. I would love to try the brussels in this curried form. Thanks Taruna. The Brussels sprouts taste really good prepared this way, just like the cabbage! So glad you got over your dislike of overboiled Brussels sprouts to bring us this curried version! Thanks Shashi! Took some time but I’m there now! Where does time go right?? ?..it’s flying. So busy with kids, weekends are crazier than weekdays. I still am learning to enjoy brussel sprouts, maybe this is a way I would love. This looks so good Nazneen, the curry sure is a great way to spruce up these little ones. The vegetables are still great here in Cali, but the dry weather is scary, a drought is not a great thing. Well anyways,have a great week my dear. Thanks Asha. I was reading about the Cali drought, and it is scary. We are plagued with droughts here in CO too. If we don’t get enough snowfall during winter then, summer time is tough for us. I hope you get some moisture. Brussels sprouts do take some time to love, but if you have them made right from the beginning, then you have to love them. The cabbage will be wonderful with this recipe, it’s my favourite way to make cabbage! Thanks Uru, they are pretty tasty this way! One of my favourite childhood memories is of sneaking my brussels sprouts onto my dad’s plate when my mum wasn’t looking. She would boil them into a sludgy, stinky mess, and dad – in the knowledge that I was a really good and unfussy eater – would always try to spare me from having to eat them. Legend. I too love brussels sprouts now, but they need to retain some crunch and be flavoured such that their sometimes nasty sulphuric smell is somewhat concealed. Your curried version sounds fantastic! Your dad was way cool! Mine did no such thing for me, but then again we didn’t eat Brussels sprouts at home, only in school! These are pretty tasty though and you won’t have to pass them onto anyone else. I have got to get over to my Indian market and replenish my curry leaves. You’re showing me so many good ways to use them. This is such a pretty side dish, I’d love to make it very soon. Thanks Lea Ann! South Indian cuisine uses a lot of curry leaves and my family, though not really from South India! their cuisine has a lot of influence. That and I love curry leaves! I’ve never curried Brussels sprouts, and I don’t know why not — I curry everything else! I’m so going to steal this idea! 😉 Really great recipe — thanks so much. Thanks John, steal away! You know, for the longest time I wouldn’t use any “western” vegetables in any form of Indian cooking. The vegetables I grew up eating Indian styles were ones that could be found on the Indian sub cont and basically, what my mother was familiar with. I guess you learn from them, but slowly I started adding spices to things like broccoli and sprouts, turns out they’re wonderful!! This looks divine! You know how much I love Indian food – it just warms my heart and makes me feel good all over! (What gets me is how people can buy a bottle of curry powder and call in Indian!) The spice combination here is heaven for me… and we have fresh turmeric available which makes the color even brighter. I am off to the market now, so will be picking up some sprouts for a mid-week supper! Thanks David! You know it’s funny about the curry powder, do you know that Indians don’t even use that particular flavour? To me it’s not Indian food, I don’t use the curry powder for any Indian cooking! I use it to add a British curry flavour to some things!! Exactly! Curry powder is British – and of course having spent time there, that makes sense. But somehow people think it is Indian. Not even close. Brussels sprouts tonight. Am hoping the Dukaan has frozen, fresh, or dried curry leaves! Absolutely beautiful! I thought I’d curried just about everything but I was wrong! Must curry some brussels sprouts!!! Thanks! Thanks Mimi! Oh, I think there’s plenty left to curry still! Thanks Bam, I am honoured you opened my post 😉 I think you would like these, they are not overly cooked and they have a nice mild spice to them. Really enhances their sweetness. Have a great week, Bam. Thank you Monica! The coconut is a mild taste, you can add more if you’d like, but the amount I used was enough for me to get the texture. I don’t think I’d add anymore personally. Dear Nazneen, first up, we live in a country of Brussels sprouts lovers – you can find them in every market, green grocers or store in winter time. And then, I also have some childhood memories of not really liking the results of overcooking that I so often pondered when looking at my dinner plate. I prepare them often, the family loves them and I do not cook them until they fall apart, on the contrary, I love roasting them, shave them into salads or make a soup with them. But now I am quite taken by your preparation. You already know that I love spices and your recipes looks just amazing, a whole new approach to preparing these little cabbages. Just wonderful and a “must-try”. Sorry for being so slow with my comments but I will “pick up some speed” as I start to feel better!